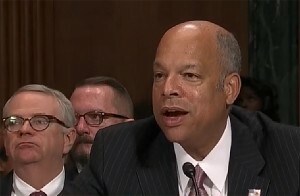 At a Senate Judiciary Committee oversight hearing chaired by U.S. Sen. Chuck Grassley (R-IA), Homeland Security Secretary Jeh Johnson acknowledged that a lapse in the U.S. Citizenship and Immigration Services’ background check procedures led the agency to erroneously grant deferred deportation to a known gang member who is now charged with four counts of 1st degree murder. Johnson also noted that a “handful” of similar cases have occurred, in which gang members or other criminals have been shielded by President Obama’s Deferred Action for Childhood Arrivals executive order. USCIS stated that since fiscal year 2013, at least 282 such cases have occurred. “Secretary Johnson’s comments today suggest a broader systemic problem in the application process. Two hundred eighty-two cases is more than a ‘handful,’ and there needs to be a better effort to provide greater detail on exactly where breakdowns occurred in the DACA application process that ended deportation procedures for at least one known gang member who now is facing four murder charges. All it takes is one lapse to lead to tragedy, but USCIS has admitted to at least 282 mistakes. There could be more. This is a significant risk to public safety and national security being created by the failed implementation of a legally-questionable action by the president. Americans deserve a government that protects their wellbeing, not one that welcomes dangerous criminals with open arms,” Grassley said. In today’s hearing, Johnson said, “If you are a member of a gang, a known member of a criminal gang you should not receive DACA. You should be considered priority for removal.” However, it remains unclear whether USCIS has a zero tolerance policy for criminals and criminal gang members applying for DACA. Scroll down to see video of the hearing from C-SPAN.